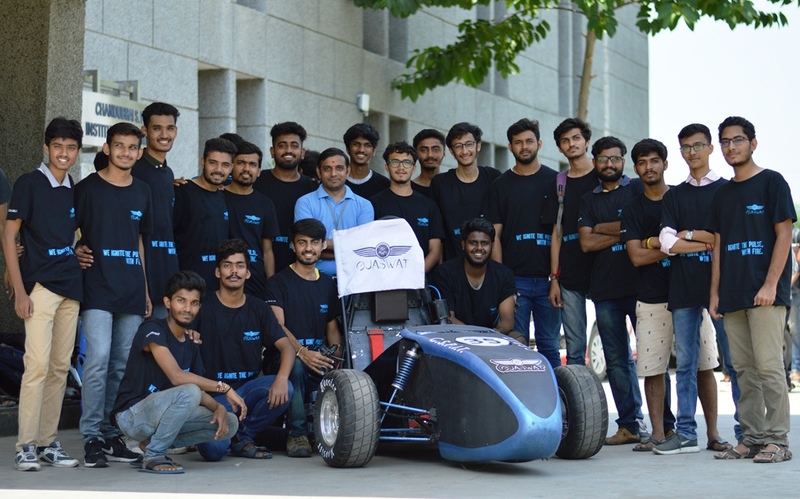 Team ‘OJASWAT’, a group of 21 young engineers (17 from mechanical and 4 from electrical ) from Chandubhai S Patel Institute of Engineering and Technology, a constituent institute of CHARUSAT are participating consecutive seventh time in the national level competition organised annually FFS 2018 organized by FMAE (Fraternity of Mechanical Automobile Engineers) at Kari Motor Speedway, Coimbatore Tamil Nadu. The event from 28.09.2018 to 3rd October at Coimbatore see 30 Teams participating from different states. It is a platform for students to apply their engineering skills to design and construct a Formula category vehicle as per defined performance and safety specifications. As per FFS India official Students get to work on the specifications of designing, sourcing of car components, fabricating, costing and even marketing their product at the event. The Organizing committee showing concern about student learning and quality of design and build of the car so there will be two official workshops from the organizers which will help the teams and participants to understand the designing, analysis, manufacturing techniques, report preparations and about the event conduction. The competition challenges teams of university graduate and under graduate students to conceive, design, fabricate and compete with their own formula style, autocross racing cars. This year, the students are tested on a range of technical attributes in a mix of static and dynamic events by an experienced panel of judges, including experts from Germany and Russia. The team with the best overall combination of design and construction, financial planning, and performance on the track will emerge victorious. The Ojaswat Race Car of CHARUSAT weigh around 32kg overall weight 210 kg, with KTM 390 Engine and tyres Imported from USA of Housier, Customized 10″ Rim of Keizer. The team consists of Captain Kaushal Prajapati, Team Manager: Parth Lad, Faculty Advisor: Anand Patel and Abhishek Swarnakar along with other members of the team. It is worth noting that, Team ‘OJASWAT’ had shined in 2014 and 2016 at national level. The Charotar University of Science and Technology (CHARUSAT) has achieved laurels at national level for formula racing car developed by its students, known as OJASWAT achieved 2nd Rank in the Skid pad Test in SUPRA SEA India Students Formula 2016. Team Ojaswat won first prize in Cost presentation round.